Each of our Churches are different, but what makes them the same is that each strives to be a friendly community and we do our best to recognise and welcome all first-time visitors, but if we don’t manage as well as we’d like, say ‘hello’ to someone over a coffee at the end of the service. In small churches it can be hard to stay anonymous but if you are looking for space to be on your own we will try to respect that. Perhaps at the end of the service you will take the opportunity to introduce yourself once you’ve (hopefully) established that we are a reasonable bunch of people after all. Our services come in a variety of levels of formality but generally follow a familiar structure. We usually follow the pattern of a Church of England Communion service (sometimes called Eucharist or the Mass) where the bread and wine are shared, or a service of Scripture and Prayers led by members of the Congregation. If they are celebrating the Communion, the Priest always wears special robes during the service. All of our services use modern language so don’t expect to find Thees or Thous. 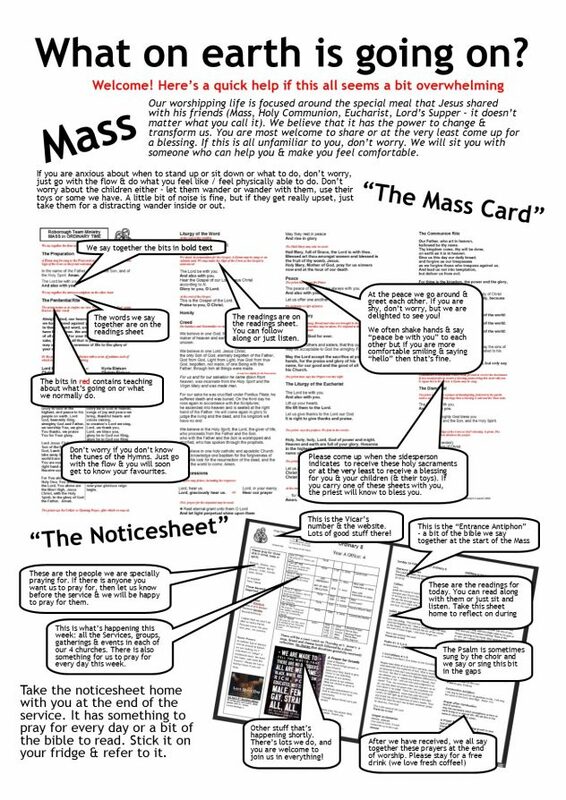 When you come in to S. Anne’s, S. Edward’s or S. Mary’s, you will be given some bits of paper: a Mass Card which contains prayers, some of which the leader (usually the vicar) says and some in bold that we say together. 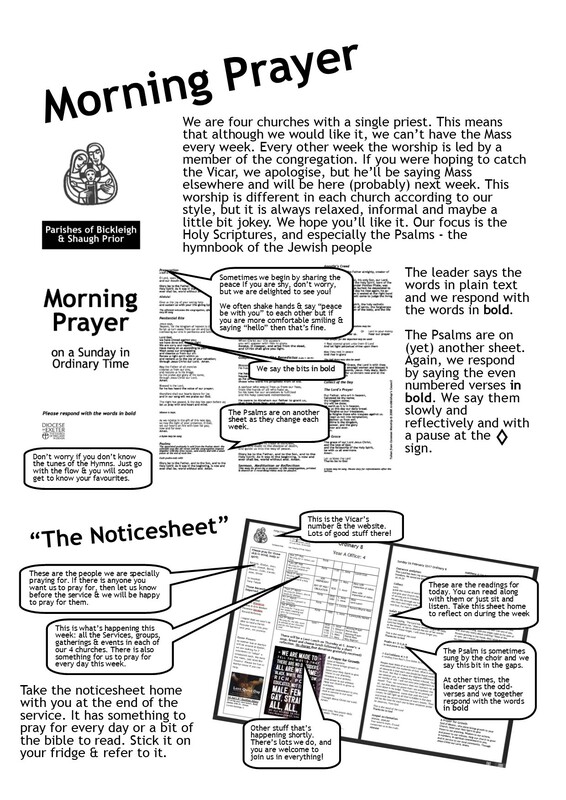 There is a weekly sheet which contains the prayers and readings for this specific week and (on the other side) any notices, a timetable of the services for this week and often a cartoon. We often say the first and last prayers on this sheet together – the person leading the service will guide you to this. You might also be given a hymn book. At S. Cecilia’s, you will probably only be given the weekly sheet as all the words and songs are displayed on the screen. At S. Cecilia’s, the leader says the words in white and our responses are usually in yellow. You may find some of the content familiar like The Lord’s Prayer, and some of them less so. It may come naturally to you or it may not. Don’t worry if you find yourself just listening to the congregation or praying inside your head, no one is judging you. At some points in the service we stand up and at others we sit down. If you are unable to do this easily, don’t worry. Communion is where churches share bread and wine in the way that Jesus did with his disciples nearly 2000 years ago. This is usually towards the end of the service after the priest has led the congregation in prayer. The congregation usually come to a rail at the front of the church to receive the bread and wine and take it by putting their hands out. In some of our churches, some like to kneel, some people like to stand; in others we all receive standing if the altar rail is not being used. If we are using the altar rail, there is no right or wrong, it’s up to you. If you don’t feel comfortable taking communion, you are still more than welcome to come forward. If you bring a service sheet or Mass Card with you, the priest will pray for God’s blessing to be on you. He usually places his hand on people’s head when he does this. S. Mary the Virgin Bickleigh and S. Edward Shaugh Prior are both open during (roughly) daylight hours so that you can come in, have a little peace and quiet with God, Light a candle and say a prayer. We like to follow the pattern of the church year so there are lots of times for celebration or preparation. This will often come with a change of colour to the furnishings in the church and different things happening during the service. It isn’t just Christmas Day or Easter Sunday when this happens so if you happen to venture into a festival, all sorts can happen. Take it as it comes, you have as much clue about what is going on as anyone else in the congregation! A collection is taken in every service of worship. Our churches have an impact upon the local area through community action. This is only possible because the people who worship here care so much about our communities that they generously give to this work. It would be fantastic if you could give generously to this work as it is only through our giving that it is able to continue. However, if you do not wish to contribute, just let the plate pass by. Many members arrange their giving via standing orders, so a significant proportion of the congregation will not be putting anything in the bag or put a little giving card in. No-one will think anything of it if you don’t contribute. Our draws upon a wide variety of different styles varying from traditional hymns to more modern worship songs. In some of our churches, we use the organ and/or a choir and in others we sing along to recorded music or videos. The congregation has a wide range of musical ability—so if you can’t sing or don’t know the tune, don’t worry, you won’t be the only one! The bible is at the heart of the faith of our communities and exploring it together is an important part of worship. They are designed for people at all stages of their faith journeys. Sometimes during Morning Worship, a member of the congregation will read a reflection or meditation or Fr Simon will “preach” – don’t worry, this part of the service generally takes less than 10 minutes, so you won’t need to catch up on your sleep during this bit! If something interests you and you want to ask a question, or want a bit more depth then either grab Fr Simon over coffee or (if he isn’t there) text or phone (07976 802123) or email (fr.simon@rundell.org.uk) him. He likes to do this stuff! There are a small number of children who regularly attend worship in our churches. At S.Mary’s and S. Cecilia’s, we have a Sunday School and children’s work also happens at other times. Children are welcome in church. We have an area for small children to play with a range of activities. Children make noise and ask questions. That’s ok – so does the vicar! God’s love is an open offer to everyone and so we make every effect to be accessible to everyone. In most of our churches, there is good access for wheelchair users and disabled toilet facilities, with the exception of S. Edward’s which has no toilet and steep steps to get in. In S. Mary’s and S. Anne’s, a loop system is fitted for people with hearing-aids. All our congregations are open to all and often has worshippers with special needs including learning difficulties and autism. Everyone is welcome. If you have any questions or require support during your visit, please just ask.